For £500.00 you can purchase our Injectable Therapies Toolkit containing everything you need to help those with Type 2 diabetes on Insulin or GLP-1 therapy who are struggling to gain control of their blood glucose levels. The toolkit includes the education curriculum and session resources for all the sessions included in this rolling programme. All patients will have to attend one of the 2 starter sessions to be able to access the topic sessions. 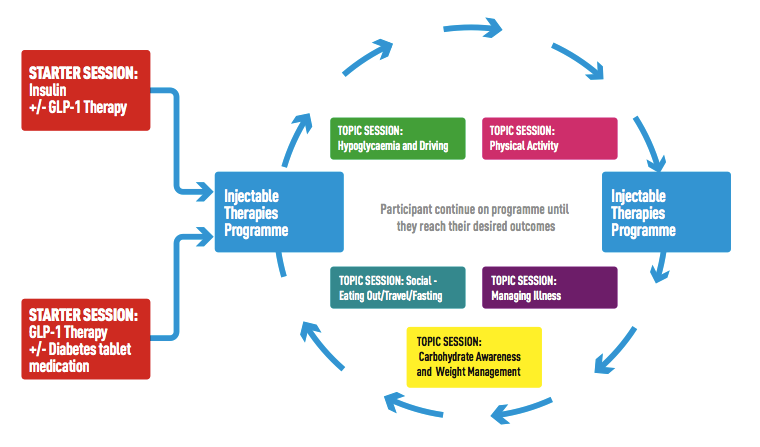 The starter sessions are split depending on the therapy (Insulin or GLP-1) and are both approx. 3 hours in length. These sessions allow time for participants to focus on what factors influence their blood glucose and provide knowledge to help them to gain better control. Each topic session is approx. 3 hours in length. A variety of resources are provided as part of the toolkit including a selection of laminates and food models. At the starter session all patients will be given a workbook which they will use throughout the sessions. It acts as an aide memoir for the key messages and also provides questions to work through to help support them to gain a better understanding of the topics and to allow them to self manage their diabetes. Enough workbooks are provided in the toolkit for your first course and then additional workbooks can be purchased from DESMOND National Office at £3 each. A place for 1 member of your team to attend our How to Use Your Toolkit workshop is included in the toolkit. This workshop will provide further detail about how to get the most from the toolkit, as well as advice and guidance for rolling out the programme locally. Additional places are available at a cost of £75.00 per person. To purchase your toolkit, please contact 0116 2585881 or email Desmondweb@uhl-tr.nhs.uk along with your delivery and invoicing details.